Rob Everett & Adrian Orr probe the banks. By Jacky Carpenter. The Financial Markets Authority (FMA) and Reserve Bank of New Zealand (RBNZ) have published a report following a four month probe into the conduct and culture of New Zealand's banks. The review followed the Australian Royal Commission into Misconduct in the Banking, Superannuation and Financial Services Industry, with its high profile highlighting of failings in the treatment of customers across different parts of Australia's financial services sector. New Zealand's big four banks - ANZ, ASB, BNZ and Westpac - are all Australian owned. Thus the FMA and RBNZ said the Australian Royal Commission raised questions as to whether the same failings exist in New Zealand too. The FMA and RBNZ, NZ’s two main regulators of financial markets, say the overall objective of their review is to understand whether there are widespread conduct and culture issues present in banks in NZ. "The FMA focuses on conduct regulation of some financial market participants, and the RBNZ focuses on maintaining a sound and efficient financial system through prudential regulation. Neither regulator has a direct legislative mandate for regulating the conduct of providers of core retail banking services [being] lending, credit, bank accounts. However, standards of banking conduct are important to the statutory purpose of both regulators, so we decided to test both directly with the banks and with key banking sector stakeholders whether or not there are widespread conduct and culture issues present in New Zealand banks," the FMA and RBNZ say. The survey focused on retail banking services, given these are used by nearly all New Zealanders. The idea was to identify conduct and culture issues and risks that might be present, and to understand how banks detect, manage and remediate these. 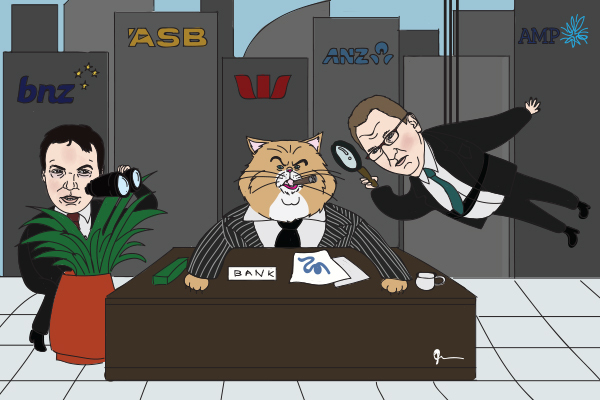 The banks in the review were ANZ, ASB, BNZ, Westpac, Kiwibank, TSB, SBS, Rabobank, Heartland Bank, The Co-operative Bank, and HSBC. "Our review was based on interviews with bank staff and directors, and documents supplied to us by the banks. The review was not an audit of individual files or accounts, or a detailed investigation of historical cases like that of the Australian Royal Commission. We assessed the information that was provided directly to us by banks, and tested this in our onsite reviews. Banks were generally open, engaged and cooperative throughout the process. We also sought insights from other banking industry stakeholders and conducted a consumer survey," the FMA and RBNZ say. The stakeholders were FinCap, Consumer NZ, the New Zealand Bankers' Association, First Union and E tu. The survey was of 2,000 New Zealanders aged 18 and over. It asked about the quality of interactions and communications with their banks, their awareness and experience of their bank's complaint processes, and the level of trust they have with their own bank and the banking industry as a whole. "We did not undertake a detailed investigation of how banks ensure that products and services, including lending, are suitable for their customers. The Australian Royal Commission interim report highlighted weaknesses in Australian banks’ processes for investigating and verifying the financial position of their customers in credit assessments. In particular, concerns were raised about Australian banks’ reliance on minimum expenditure benchmarks, rather than estimating actual customer expenditure," the FMA and RBNZ say. The regulators say they received more than 1,000 documents from the banks, interviewed 572 staff ranging from frontline staff to senior executives and directors, visited head offices, contact centres and branches. Six of the 11 banks had a bank representative, such as a staff member from its regulatory affairs, team present in the interviews with bank staff. When this was the case the regulators say they also provided the opportunity for staff to speak to them without the bank representative present. Bank staff were advised that what was discussed was in confidence and did not need to be disclosed to their employer. The review took place over four months and did not include an audit or detailed investigation of each bank, did not review individual transactions, accounts, credit decisions or product sales. While a critical fact check was undertaken with each bank, the findings were not discussed with the banks and stakeholders prior to the completion of the report. The regulators point out that the conduct of banks directly affects their customers. "High standards of conduct support the fair, sound, efficient and transparent delivery of banking products and services, as well as confident participation by retail customers, businesses and investors in banking. Poor conduct is a contributing factor to poor customer outcomes and loss of trust in the banking system, and can be associated with other banking risks. One of the key drivers of conduct is a bank’s culture. Culture influences how management and staff behave on a daily basis. An effective culture within banks includes consistently putting customers at the centre of decision-making, product design, sales and advice processes, and all day-to-day activities," the FMA and RBNZ say. "In this report, we do not attribute findings to individual banks, because our focus is on the industry as a whole. However, we do draw some conclusions in relation to large banks and small banks.The four largest banks (ANZ, ASB, BNZ and Westpac), which we refer to collectively as ‘large banks’, each have a market share of at least 14%. All of the other banks, collectively referred to as ‘small banks’, each have a market share of less than 8%. We also considered whether there are gaps in the framework for the regulation of retail banking services that may undermine the effectiveness or efficiency of conduct supervision or regulation."